What are Flu Symptoms in Adults? Though seasonal flu (influenza) symptoms in adults can look like a common cold, if you have a high fever, chances are good you have the flu. 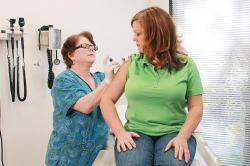 Seasonal flu – or flu season – normally starts in the fall and ends in the spring. An outbreak often begins when children head back to school and the virus is easily spread. Flu symptoms in adults are similar to flu symptoms in children, except that young children may also experience stomach pain, nausea and vomiting, not the norm for adult flu sufferers. Flu symptoms in adults are highly contagious and in certain populations can be very dangerous. Individuals at higher risk for common flu-related complications, such as pneumonia, include people over 50, anyone with heart or lung disease, pregnant women and people with compromised immune systems. Get your flu shot at the FastMed Urgent Care nearest you. No appointment necessary, we’re open 365 days a year. Getting your Flu shot at FastMed is easy. There are two methods for getting the flu vaccine: traditional injection and nasal-spray vaccine. Traditional flu shots inject an inactivated vaccine (containing killed virus) while the nasal spray vaccine is made with live, weakened flu viruses. Flu shots protect you from the current year’s influenza strain but also protects against more viral strains, such as Swine flu or H1N1. Flu symptoms in adults come on very quickly. There are antiviral drugs – not antibiotics – that can be prescribed to shorten the duration of the flu and reduce your symptoms but they work best when administered at the onset of the symptoms. If you fall ill, remember there’s no appointment necessary, come as soon as possible for immediate flu treatment at FastMed Urgent Care.